For Small Business Owners, Managers and Entrepreneurs ! Whether you’re just starting out in business or have been running your business for years you want and need to be successful! Do you want to achieve business and life success? It’s very important to define your success and know what it is you are looking to achieve with your business. Is it earning a certain amount of money per year? Is it being happy in what you do day to day? Is it having no boss? Is it about providing for your family and spending quality time with your family and friends? Is it about working less hours for more money? Is it about knowing your future is now secure? Is it about having more holidays and time doing what you love, knowing your business is still providing you with an income whilst you are not working in it? We have found the above to be most small business owners’ definition of success. They do not make anywhere near the amount of money they intended on earning. They work long hours (sometimes more than their staff if they have staff) and rarely see their family or get to do what they love. Their future is far from secure. They start to not enjoy what they originally loved and were passionate about. If they manage to take a holiday they spend all their time worrying about their business, their income is reduced massively or stops completely. They are their own boss however at this stage they spend time thinking “I wish I was an employee”. 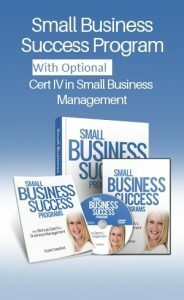 Check out our first program in the “Small Business Success” suite of programs.